The objective of this study was to examine the differences in sow metacarpal properties through various parities and to compare the incidence of locomotory problems between stalled and loose-housed sows. Metacarpals (n = 110) of sows from six farms were collected at slaughter and stored at -20°C. Bones from one forelimb of sows in stalls (n = 36) and loose-housed (n = 20) were collected and their articular surfaces examined for Osteochondrosis Dissecans (OCD), these sows were also scored for lameness pre-slaughter. Metacarpals were CT scanned for cross sectional area and moment of inertia. Cylindrical sections from the diaphysis were used for mechanical testing and calculating bone strength indices. The results show there was little change in bone mineral status throughout the range of parities examined and overall metacarpal integrity was not compromised by multiple production cycles. There were no differences detected in the incidence of lameness or joint pathology between housing systems. 2. To compare the articular surfaces in the bones of cull sows in different housing systems and to examine any associations with lameness. There are numerous reports in the literature citing lameness as a significant cause of premature culling. However, the reason for lameness and any association with housing type remains unclear. High culling rates due to a potentially painful condition may indicate compromised welfare for the animals involved and warrants further detailed examination. The animals used in this survey were those being routinely culled and sent to the abattoir from the herds for commercial reasons. All of the farms commenced routine removal of breeding sows once their eighth parity was reached unless it was removed prematurely for health or economic reasons. No sow was kept beyond their ninth parity. Ill or severely injured sows were not included in the study as they were not transported to the abattoir but were humanely destroyed on the farm of origin. Four of the farms had an on-farm milling system in place and none of the commercial farms used phytase. Most of the farms fed a wet diet to the breeding sows. Prior to slaughter, sows were observed walking and trotting freely on concrete and lameness scored using the system (0 to 5) of Main et al. . Joint surfaces were grossly examined post mortem for defects consistent with osteochondrosis dissecans (OCD) or osteoarthritis (OA) using the system of Nakano et al. ,(1 to 7). Lameness distribution (from loose or stalled systems) percentages were calculated for both the total number of lame and normal sows. Metacarpals were collected from sows from farms A to MP in Table 1 (metacarpals have been used by several authors as indicators of skeletal health [6, 4, 26]). The samples were obtained immediately after slaughter and stored at -20°C in polythene bags. Sow carcass weights were also recorded. 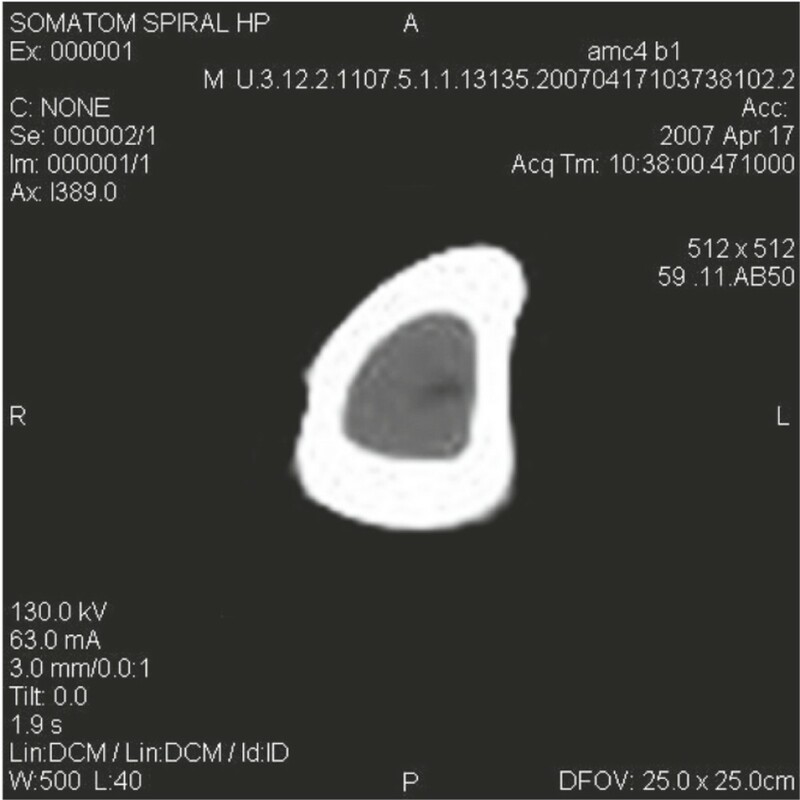 CT image of metacarpal cross section used to measure cross sectional area and moment of inertia. The use of CT scans to measure geometrical properties is preferred to assuming certain shape types and applying standard formulae because assumptions about cross sectional geometry, bone shape and distribution are circumvented . Mid-diaphyseal sections from the metacarpals were cut using a band saw (Rexon Laser, Rexon Ind. Corp. Ltd.) for compression testing. The section had a width to length ratio of 2:1 to reduce the buckling effect as recommended by Keaveny et al. . The principle of Archimedes was used to determine the volume of the bone specimen with marrow and periosteum tissues manually removed. The bone was weighed using an OHAUS Scout pro SPU202 balance, OHAUS Corp. NJ USA in air and suspended in distilled water. Bone specimens were tested in compression at 5 mm min-1 until failure using a Hounsfield instrument (model H50K-S, Redhill, Surrey, UK). The resulting data were collected using software (QMAT 4.52 S Series) which plotted a graph of applied load (Newtons) versus displacement (mm). Platens were fixed at the lower end only to allow self-alignment. Young's modulus was calculated from the linear section of the stress-strain curve. Metacarpal ash content was determined using a muffle furnace at 105°C for 12 hours to remove moisture and at 650°C for six hours to determine bone ash percentage on both a dry and fresh weight basis. Bone mineral density was calculated by dividing the ash weight (g) by the specimen volume (cm3). Statistical analysis was carried out using the methods of SAS 1985 Inc, Cary, N. Carolina. All data were tested for normality using proc univariate. To analyse the metacarpal data the sows were grouped according to three parity ranges; 1 to 3, 4 to 6 and 7 and over. Differences in metacarpal properties among the three parity ranges were determined using the analysis of variance (ANOVA). Sow carcase weight (Kg) was used as a covariate when analysing parity differences. Forelimb joint pathology and lameness scores were analysed between housing systems using proc npar1way. A Chi square analysis was performed on the lameness percentages between the two housing systems using proc freq. Metacarpal strength and geometrical results for each parity range are presented in Table 2. Significant differences among the ranges were found with respect to cross sectional area (P < 0.01), cross section moment of inertia (P < 0.001) and apparent density (P < 0.05). Theses three indices increased significantly from the early to the mid parity range and there were no significant changes thereafter. There were no significant changes in the other indices measured throughout the parity ranges examined. Specifically, there were no significant decreases in bone mineral density, elastic modulus or ash content from early to late parity in the sows examined. A seventh farm (F), not included in the metacarpal integrity survey, was used to compare joint pathology between stalled and loose-housed systems where sows are kept on straw bedding. Results from these analyses (Table 3) show no significant differences between housing systems for severity of joint surface or lameness scores. A Chi squared analysis showed no significant differences between the housing systems for lameness frequency. The results (Table 2) show geometrical parameters cross section area (CSA) and cross section moment of inertia (CSMI) were significantly different among parity ranges. Parameters related to the quality of the bone substance, namely bone mineral density, elastic modulus, dry matter and ash content, were not significantly different. An initial increase followed by a plateau in the CSA and CSMI through early to late parity was expected due to the sow growing in size and reaching maturity. In addition to the normal metacarpal growth patterns of size and shape there may also be a different control mechanism for the consistency of bone substance. Size and shape may be secondary properties, which may be altered according to the individual's age and weight-bearing requirements. Tanck et al. reported a time lag between density and architecture formation in trabecular bone of pigs. In addition, this author stated that architecture was more efficient in later years at adapting to loading and that density is adapted to external load from the early phase of growth. This phenomenon has been found in humans examined by Cheng et al. . This suggests a possible compensation mechanism for lower BMD by increasing bone volume and size. These findings would suggest that larger bones are not necessarily stronger than smaller bones. This study found the metacarpal geometry to reach its maximum dimensions' during the mid parity range, while there was no significant changes in the bone quality parameters. This suggests the bones reached their maximum size and quality during the mid range and there were no significant reductions subsequently in their later parities. No evidence was found of reducing metacarpal integrity due to multiple pregnancies. Bone mineral density, elastic modulus, dry matter and ash content showed no significant changes from early-to-late parity throughout the sows' lifetime. This demonstrates that sows from a number of different farms are able to maintain metacarpal integrity despite multiple parities and lactations. These conclusions were also made by Giesemann et al. who found metacarpals and coccygeal vertebrae of mature sows to have higher ash weights than those of young sows. It is widely accepted that a pregnancy and subsequent lactation increases the mineral demands on the sow . As these minerals are ultimately obtained from the diet it would suggest that sows may adapt to the demands of the foetus and lactation by altering their absorption of dietary minerals. This has also been stated by Nimmo et al. . In addition, during lactation higher feed intakes further increase mineral intake. Furthermore. larger mature sows could consume more feed than younger sows. It is possible that there is a hormonal effect on mineral metabolism and this has been postulated by Kemme et al. and Vajda et al. who stated that the female reproductive cycle substantially alters mineral metabolism. It is likely that a combination of these three mechanisms allows the sow to adapt to the higher demands of pregnancy and lactation to maintain long-term bone integrity. Both Phillips et al. and Vajda et al. stated that osteoporosis in pregnancy is a rare clinical problem. It is important however to limit the conclusions of the survey to the bones examined as not all bones are effected equally. Mahan and Fetter  found the bones of the axial skeleton to be more susceptible to demineralisation. Maxson and Mahan  stated that this was due to their greater proportion of trabecular bone. Any decreases in bone mass during lactation are transient and appear to be partially restored in humans after weaning. Studies have shown lactation not to increase fracture risk and may even have a protective effect in both rats and humans [11, 31]. Maxson and Mahan  stated that a relatively short 21-day lactation over two parities in sows did not impose a severe enough nutritional insult to cause differences in bone demineralisation. Vajda et al. showed reductions in vertebral compressive strength to be restored eight weeks post-lactation in rats and in addition that restoration of BMD in humans is rapid and any decrease in biomechanical parameters associated with lactation rarely cause pathological fractures. Spencer  stated that swine are similar to humans in bone structure and mineral metabolism. No differences in lameness score or joint pathology were detected between the sows on straw bedding (farm F) and stalled animals (farm MP). All 56 sows examined (Table 3) had lesions of OCD and subsequent osteoarthritis. The diagnosis of OCD in such a large proportion has been found by several other authors. Nakano et al. found greater than 90% and Jørgensen and Vestergaarad  stated OCD was present in all fast growing pigs. OCD is frequently implicated as the main cause of leg weakness and subsequent economic losses from premature culling [7, 15, 5]. The chronic persistence of a pathological condition contributing to economic losses would suggest that the elimination of OCD is expensive and potentially difficult. Even today, the exact aetiology remains unclear. Crenshaw  describes OCD as idiopathic, Ekman and Carlson  describe it as multifactorial. In addition to other authors, Schenck et al. , found no difference between confined and stalled sows and Uhlorn et al. found no difference in the incidence of OCD between purebred pigs and those crossed with wild boar. Both of these studies would indicate that neither genetics nor housing alone were responsible for OCD. The loose-housed sows had access to more space but that does not imply they were more active as straw bedding would be more comfortable than a concrete floor. In addition, the sows on straw are better insulated from any heat loss to the concrete . Heat loss has been shown to affect pig performance and weight gain as this increases metabolic rate and energy requirements. In contrast, exercise causes an increase in muscle mass . This author also demonstrated that increased forelimb muscle weight in the pig has significant influence on bone strength and this was found to occur more in loose-housed sows than with stalled animals. Crenshaw  stated that physical weight bearing influences the incidence of OCD but there was no evidence to support or reject a specific housing type with regard to their influence on OCD. This was also found by Kirk et al. . In contrast, Fredeen and Sather  found cartilage damage to be greater in pigs confined individually compared to those kept in a group. This study found no differences in the incidence of OCD between the housing systems. This would suggest changing pigs from a stalled-house to a loose-housed system alone would not decrease the incidence of OCD. There is no reduction in metacarpal bone integrity with increasing parity. Housing type did not influence joint pathology or incidence of lameness in sows.